By Rumi in R.A. Nicholson’s – Rumi, Poet and Mystic, London, 1950. At the very outset, two observations, in the main, may be made here. First, in the Sindhi dharma or religion, which may be best described as a way of life, God is both transcendent and immanent, or impersonal and personal. As regards the second observation, the Sindhi dharma is a mix of Vedantic, Sufi and Sikh thought and practices and in this mix of Sindhi dharma, God can be realised in both impersonal and personal ways. The above mentioned poem “The Shepherd’s Prayer” by Jalaluddin Rumi brings out vividly the two approaches of the philosopher and the devout simple people. In it, the philosopher’s One God becomes many all-too-human gods. 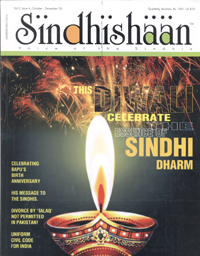 The Sindhi dharma is secularist. It presents the Indian subcontinental view of secularity, which is not the state or quality of being non religious, as understood in the Western tradition, but that of being variously religious. Deep spirituality that attends this kind of secularity makes one rise above the narrow confines of one’s own religion and respect all religions of the world. And this kind of secularity evolved as it is by the Indian mind over the centuries, suits the Indian multireligious society the most. It is different from the one obtained in the unireligious societies of the West. So far as the first ingredient VEDANTA of our Sindhi dharma is concerned, it was developed by various commentaries on Badarayana’s Vedanta Sutra and the Upanishads. Its major trend advaita (nondualism) was set off by Sankaracharya in the 8th century. According to him, Brahman is omniscient, omnipotent and the cause of organisation, sustentation and resolution of the world. The world contains no other reality except Brahman or the Absolute Spirit. Everything except the Absolute is an illusion (maya); the socalled individual soul is the Absolute itself, and no other. Brahman or the Absolute Spirit admits of no limitation and denomination and is the Boundless Reality. It admits of limitation only with reference to something which is not consciousness. Otherwise, there is no duality. that is, Move together in unison, conduct dialogues among yourselves with goodwill. Share your knowledge in harmony. Despite the fact that the Sindhi dharma has been secular in outlook and Sindhis have believed in the peaceful co existence over the millennia, poetry of the Hindu Sindhis was systemically destroyed by the Kalhora and Talpur rulers, preceding the Britishers in Sindh. It was Chainrai Bachomal Sami (1743–1850), who eloquently voiced the Vedantic wisdom of the people of Sindh. He wrote his slokas in the Gurmukhi script on pieces of paper and treasured those slips in a big earthen pot kept in a corner of his shop in Shikarpur. Kauromal Chandanmal Khilnani published Sami Ja Sloka in three volumes the first two in 1885 and the third in 1892, many years after the conquest of Sindh by the Britishers in 1843. Sami, a merchant himself, knew that in the world of ‘maya’ or illusion, hardly did any merchant, for that matter anyone, engage himself in true dealings; everyone exploited others; the rich exploited the poor and the pseudoGurus used the credulous people for their own ends. A saint poet who appeared on the Bhakti Movement in its last vestiges, Sami wrote the slokas embodying everything the Bhakti Movement espoused. Referring to the six shastras, the eighteen puranas and the four Vedas, he emphasised on self-introspection. Why do you then go from door to door? And experience Him now and here. Two ears hear That One and don’t feel satiate. And I wish I were in the timelessness of the lilt. It would be pertinent to say here that the Hindu Sindhis have been worshipping Uderolal, which is the Sindhi form of the Krishna archetype popularly known as Jhoolelal Saeen, since the year 950 of the Christian era. That is, Karma (action), bhakti (devotion) and jnana (knowledge) say one and the same thing. Sami draws his imagery from what he sees around him in his day to day life. For instance, the images of Kamal (lotus) and bhramar (the black bee); jal (water) and meen (fish); seep (oyster) and sagar (sea) and mriga trisna (mirage) are quite familiar to his coreligionists. From where has this discord developed in the people? who is there in the babool? Only while Sasui did I experience grief. His Shah Jo Risalo is not a philosophical treatise, but it propounds the doctrine of wahdat alwajud, which is nothing but advaita, or nondualism. Nondualism in its political and social implications is opposed to the narrow setup of theocracy and to the disparities on grounds of wealth, heredity, etc. The Shah Jo Risalo embodies these ideals. That the Sufi poet was deeply influenced by Indian mysticism is evident from the fact that he, unlike the mystics of the Islamic world, described himself, or for that matter the seeker, in the role of a female lover and depicted God as the Man in her life. He became Lila, Marui, Moomal, Noori, Sasui, Suhini and Sorath the heroines of the Sindhi folktales, who he delineated in his poetry. Through them he objectified his emotions. It is from the very beginning (of the world) a false stone. Maru was a poor young woman. She was kindapped by the Chieftain Umar of Amarkot and he offered her a good comfortable life in his mansion. But she did not accept it and remained faithful to the man in her life in the village. She says to Umar, remembering her beloved Khetsen. O Khetsen, my Beloved, I still cognise it. I shall die without you. the majestic bracelet on her wrist. There the Love strings play the song of unity. and put alif before it. This brings us to the third factor of SIKHISM in our Sindhi dharma. Like Sami and Shah Abdul Latif are central figures who represent Vedanta and Sufism respectively, Guru Nanak (1469–1539) founder of Sikhism is the father figure in it. As the Gita, the Bible and the Quran are venerated by the Hindus, the Christians and the Muslims generally, so the Hindu Sindhis worship the Gita in general and Sami Ja Salok, Shah Jo Risalo and the Jap ji in particular. In fact, in the Sindhi homes, the Hindu Sindhis give scriptural importance to the Gita, Sami Ja Salok, Shah Jo Risalo and the Jap Ji. The first three books come so close to the fourth book Jap Ji (for that matter the Adi Granth, which comprises it) that the Hindu Sindhis are endearingly called “half Sikhs”. No ceremony in our homes, be it birth or death, is complete without making reference to or taking refuge in the Adi Granth. The Adi Granth was compiled by Guru Arjan in 1604 at Amritsar. And its second version was finalised by Guru Gobind Singh in 1705. While Guru Arjan’s compilation comprised 5756 verses of the first five Gurus, including himself, and the Hindu bhaktas and Muslim dervishes, Guru Gobind Singh’s version added 115 verses of his father Guru Tegh Bahadur, bringing the total number of verses to 5871. Not of any oracular kind, the Adi Granth, thus prepared, is a handiwork of humans in the late medieval times. Its words as ordinary and commonplace as we speak at home, in the street and market place cast in folkmusical verse forms become the Word of God. Its collective wisdom of humans the gurus, bhaktas and dervishes becomes divine grace of God. what would be your worth, O destroyer of the worldly darkness! If you cannot destroy my (bad) deeds? What about my seeking refuge in you, O great lion! If jackals, too, devour me? The other was Mian Mir (1550–1635), the maternal grandson of Qazi Qadan of Sindh. He was the Mughal Prince Dara Shikh’s preceptor and inspired him in his efforts of uniting “the two oceans” of Hinduism and Islam. He was invited by the fifth Sikh Guru Arjan to lay the foundation stone of the Golden Temple at Amritsar. His tomb is in Lahore, now in Pakistan. Why then divide it into the high and the low? In the creation, the creator is everywhere. on both your left and right, he is one and the same Satguru. Thus, the best of Hinduism (advaita Vedanta), Islam (Sufism) and Sikhism congeal into the Sindhi dharma. – A renowned writer in Sindhi, Hindi and English, was actively involved in establishing 'Sindhi Education Society', Lajpat Nagar, New Delhi in 1953. – Post-Doctoral visiting scholar, Havard University USA 1979-80. – Editor 'Indian Author', of Authors Guild of India 1985-90. – Recipient of 6 awards from Ministry of HRD for outstanding literary contributions. – Recipient of awards from Govt. of Delhi in 1988 and Govt. of UP in 1990 for contribution in Hindi literature. – Recipient of Padmashri Award in April 2003 for contribution to literature and Education.